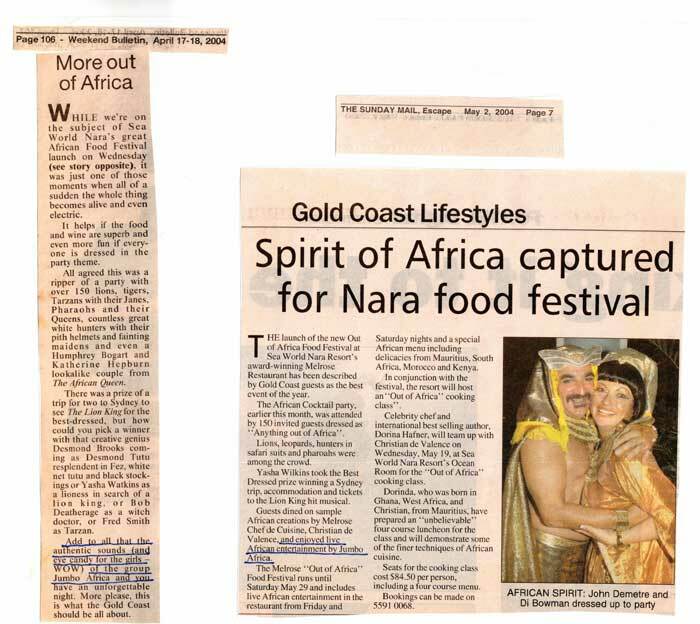 The launch of the new Out of Africa Food Festival at Sea World Nara Resort‘s award-winning Melrose Restaurant has been described by Gold Coast guests as the best event of the year. Earlier this month, I50 invited guests dressed as “Anything out of Africa” attended African Cocktail party. Lions, leopards, hunters in safari suits and pharaohs were among the crowd. Yasha Wilkins took the Best Dressed prize winning a Sydney trip, accommodation and tickets to the Lion King hit musical. Guests dined on sample African creations by Melrose Chef de Cuisine, Christian de Valence. Also, they enjoyed live African entertainment by Jumbo Africa. The Melrose “Out of Africa” Food Festival runs until Saturday May 29. It includes live African entertainment in the restaurant from Friday and Saturday nights as well as special African menu including delicacies from Mauritius, South Africa, Morocco and Kenya. In conjunction with the festival, the resort will host an “Out of Africa” cooking class”. Celebrity chef and international best selling author, Dorina Hafner, will team up with Christian de Valence on Wednesday, May 19, at Sea World Nara Resort’s Ocean Room for the “Out of Africa” cooking class. Dorinda, who was born in Ghana, West Africa, and Christian, from Mauritius, have prepared an “unbelievable“ four course luncheon for the class. Moreover, they will demonstrate some of the ﬁner techniques of African cuisine. Seats for the cooking class cost $84.50 per person, including a four course menu. Bookings can be made on 5591 0068.